The very notion of the courtyard is laden with paradoxes - private, natural outdoor space in the midst of public urbanity; an intimate collaboration between nature and the interior realm where earth and flora are pleasingly integrated with the solid stone and brick constructs of man. Blurring the boundaries between the indoors and out, the Nouvelle Courtyard Collection is designed to explore these intervening spaces. 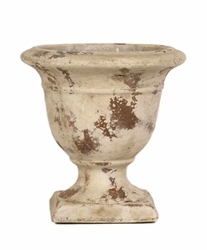 Each Courtyard Collection urn features a Distressed Terra Cotta finish and is filled with one of eight inspired fragrances uniquely designed for this collection. The scent of the sweet olive tree on a soft Southern summer evening is finished with light citrus notes. Clean, effervescent, with just a hint of duskiness. Mandarin orange tempered with amber and subtly finished with just a light brush of patchouli. The right fragrance choice for a lazy Sunday morning while drinking coffee in the sunroom.